Parents who aren't anti-vaxxers but spread out their children's vaccines at a more gradual pace than doctors recommend. Pediatricians warn that could leave small children vulnerable to disease. Elyse and Robert Imamura with their son, Amaru. They limited the number of vaccines for their son, but Elyse Imamura concedes, "If there had been outbreaks like now, it would have affected my thinking about delaying vaccines." “Every day you are eligible to get a vaccine that you don’t get one, the chance of an invasive disease remains,” said Charles Golden, executive medical director of the Primary Care Network at Children’s Hospital of Orange County (Calif.). Recent outbreaks of measles, mumps, and whooping cough have once again reignited a war of words over vaccinations. The squabble is often painted as two-sided: in one camp, the medical establishment, backed by science, strongly promoting the vaccination of children against 14 childhood diseases by age 2. In the other, a small but vocal minority — the so-called anti-vaxxers — shunning the shots, believing that the risks of vaccines outweigh the dangers of the diseases. Alternative vaccine schedules have been around for years, promoted by a few doctors and touted by celebrities such as actress Jenny McCarthy. President Trump endorsed the idea during a 2015 Republican presidential debate. The concept gained a large following more than a decade ago, when Robert W. Sears, an Orange County, Calif., pediatrician, published The Vaccine Book, in which he included two alternative schedules. Both delay vaccines, and one of them also allows parents to skip shots for measles, mumps, and rubella (MMR), chickenpox, hepatitis A, and polio. Sears’ book became the vaccination bible for thousands of parents, who visited their pediatricians with it in tow. But his ideas have been widely rejected by the medical establishment and he was punished by the Medical Board of California last year after it accused him of improperly exempting a 2-year-old from all future vaccinations. He declined to be interviewed for this article. The ideas promoted by Sears and others have contributed to parents’ worries that front-loading shots could overwhelm their babies’ immune systems or expose them to toxic levels of chemicals such as mercury, aluminum, and formaldehyde. But scientific evidence does not support that. Infectious-disease doctors and public-health officials say everyday life presents far greater challenges to children’s immune systems. “Touching another human being [or] crawling around the house, they are exposed to so many things all the time on a daily basis, so these vaccines don’t add much to that,” says Pia Pannaraj, a pediatric infectious-diseases specialist at Children’s Hospital Los Angeles. “When you look at babies that have received aluminum-containing vaccines, you can’t even tell the level has gone up,” said Paul Offit, professor of pediatrics at Children’s Hospital of Philadelphia (CHOP) and director of the hospital’s Vaccine Education Center. The same is true of formaldehyde and mercury, he added. Parents who are concerned about mercury, aluminum, or other vaccine ingredients should avoid information shared on social media, which can be misleading. Instead, check out the Vaccine Education Center on CHOP’s website at www.chop.edu by clicking on the “Departments” tab. If your child has a condition that you fear might be incompatible with vaccinations, discuss it with your pediatrician. 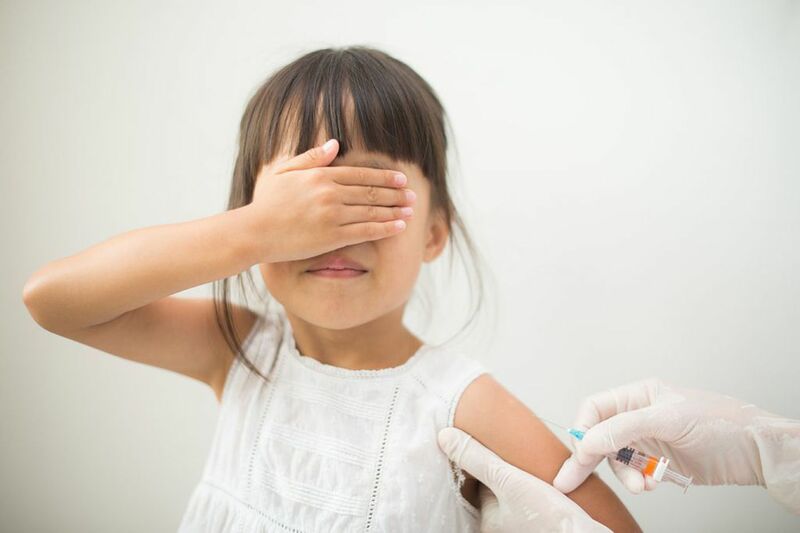 The CDC gives very specific guidelines on who should not receive vaccines, including kids who have immune system deficiencies or are getting chemotherapy or taking certain medications. Still, side effects do occur. Most are mild, but severe cases — though rare — are not unheard of. To learn about the potential side effects of vaccines, look on the CDC website or discuss them with your pediatrician. Emily Lawrence Mendoza, 35, of Orange, Calif., says that after her second child, Elsie, got her first measles, mumps and rubella (MMR) shot at 12 months of age, she spiked a fever and developed a full body rash that looked like a mild version of the disease. It took three visits to urgent care before a doctor acknowledged that Elsie, now almost 5, could have had a mild reaction to the vaccine. After that, Mendoza decided to adopt a more gradual vaccination schedule for her third child. This KHN story was first published on California Healthline, a service of the California Health Care Foundation.